Tópico em 'Seguimento Meteorológico' iniciado por Mário Barros 1 Mar 2012 às 00:02. A broad ridge is located over western Europe, while a deep trough covers the eastern part of Europe. A cut-off low slowly moves eastward and enters the Iberian Peninsula. Dry and warm air masses are present across the high pressure area. Elevated mixed layers have developed over Spain and are also indicated by soundings across France. Underneath the inversion across the western and central parts of Europe, low-level moisture has started to increase. Mixing ratios of 7 g/kg can be expected over central and northern France and over parts of the British Isles. However, strong capping inversions are expected in the afternoon hours, when weak CAPE may build over France. Given weak forcing, thunderstorms are pretty unlikely. Further east, weak low-level moisture will limit the thunderstorm potential. Ahead of the approaching cut-off low, a moist maritime air mass spreads into Portugal and western Spain. QG forcing is forecast and lift will lead to increasing lapse rates. Models expect that the capping inversion will weaken from the west during the period, and thunderstorms will become likely from the noon to the evening hours, when low-levels will be relatively warm. The strong mid-level winds that surround the cut-off low will be associated with rather large vertical wind shear exceeding 20 m/s in the lowest 6 km and 10 m/s in the lowest 3 km. Additionally, favorably veering profiles are expected and 100 m²/s² 0-3 km SRH is forecast. This will enhance the chance of rotating updrafts. Supercells that develop are forecast to produce large hail given the low wet-bulb zero level. Isolated severe wind gusts are not ruled out with the easternmost storms that may encounter drier mid-level air masses. In the evening and night hours, low-level cooling will lead to decaying storms. Elevated thunderstorms may continue through-out the night, but severe threat will be rather weak with these storms. Faro, Beja, Setúbal e Lisboa com aviso amarelo devido à precipitação "Aguaceiros, por vezes fortes, de granizo e acompanhados de trovoada." Santarém e Évora "adicionados" ao grupo de distritos sob aviso amarelo. 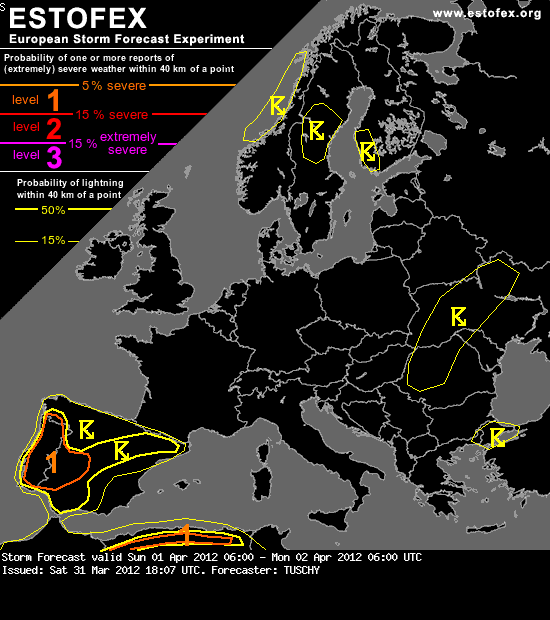 A level 1 was issued for parts of Portugal and Spain mainly for isolated large hail. At 16 Z (31st March) the surface 10°C isodrosotherm moved well ashore and this onshore flow continues during the night before moist inflow relaxes as cyclonic vortex moves more to the east. Confidence is high that best BL moisture will be found from the Serra da Estrela (Portugal) to Sierra de Gredos and all the way to the Sierra Nevada (Spain) with dewpoints in the lower tens. Forecast soundings show drier air atop that moist surface layer, so daytime mixing may bring dewpoints down a few degrees. Further east, moisture becomes worse with highest values confined to the mountainous areas. With 500 hPa temperature dropping to less than -20 °C, lapse rates become steep enough for modest MLCAPE build-up, probably maximized over Portugal and W-CNTRL Spain. CAPE peaks at 500-800 J/kg with a rapid decrease to the east. In the LL CAPE field, signals of abundant CAPE appear with weak moisture pooling along the upslope side of the complex topography...up to 150 J/kg LL CAPE is forecast.